I never liked being indoors if I could help it, so when the blacksmith asked me to take four newly shod ponies up to the Apache camp, I damn near took his hand off in my hurry to say yes. I spent most of my days working in the livery or the blacksmiths, so I never said no to running errands. My horse trotted along the road out of Retribution. Blue sky stretched in all directions and I sat back in the saddle to enjoy the sun on my face. It was a twenty minute ride out to the hills and I was damn well gonna enjoy it. The Apaches had a bad reputation in Arizona but the band near Retribution just wanted to live quietly, not bothering anyone. Some of the folks in town thought the only good Apache was a dead Apache, so it fell to people like me to run between the two. Sometimes I took supplies, sometimes I brought things back. That day I was delivering their ponies. The road led up into the hills and I let Applejack slow to a walk. She was my beautiful grey and white mare and I figured she'd enjoy the exercise. Mr Foster was expecting me back at the livery but on a day like that, you couldn't help taking your sweet time. A thin scream broke the peace and quiet. I whipped around, trying to spot the source. It sounded like a woman, and I thought of my Peggy. My hand strayed to my Colt at my belt, just in case. Another scream, this time followed by a string of shouts. I couldn't make out the words but it sounded like some kind of taunting. That didn't sit well with me, so I climbed down from Applejack, drew my gun, and made my way up the rocky outcrop to my right. Four Apache boys, probably about sixteen, crowded around something heaped on the ground. Three of them held sticks, and the fourth held a horse whip. He raised it above his head and brought it down on the heap. Another scream. They turned around when I shouted. They all cowered in toward each other, their sticks twitching at their sides. One of them stared at my Colt. They kept scowling, refusing to move. I holstered my gun and made a 'shoo' motion with my arms - the sudden movement made them scatter. The boy with the whip turned, his face full of fear, and he tossed the whip into the bushes. I knelt on the ground beside the heap, which turned out to be a much younger Apache, probably about thirteen. Bruises covered his arms and legs, and livid red slashes opened his bare back. He waved away my hands, crawling to his knees by himself. Tears ran clear tracks through the dirt on his face. He nodded. I stood up and he slowly pulled himself to his feet. He swayed, and grasped my arm. The four bullies lurked at the back of the clearing, pressed against the rocks. I growled at them and they clambered away. I turned back to the boy. "You live up at the camp?" He nodded again. I led him out of the clearing and back towards the horses. I helped him climb up onto one of the Apache ponies, and climbed up into Applejack's saddle. "I'm headin' up there, I'll take you home." He didn't say a word but he stared at me the whole way back. We reached the camp and all eyes fell on us - I shivered with so many people staring at me. The Apache leader made his way through the silent group - I think Nantan was the only one who spoke English, besides the boy. I did all of my trading through him. I told Nantan what I'd seen. He narrowed his eyes and scanned the group. I spotted the four bullies loitering behind a knot of fellas so big they damn near looked like trees. I pointed them out and Nantan grimaced. "I brought your ponies back, all shod and ready to go." I pointed to the horses. I felt uncomfortable with so many people staring at me, and I didn't want to get caught up in Apache business. Suddenly I forgot about how beautiful the day was, and I just wanted to get back to town. Nantan helped the boy down from the horse. Instead of running off to find his momma, the boy stood in front of his chief, staring up at me. "Mr O'Donnell, I should introduce you. This is my son, Mahko." I held out my hand. A few of the Apaches gasped - guess they didn't see that many white folk holding out hands to them. I don't think I ever understood the hatred. Half of Retribution's population came from Irish settlers, so it wasn't like this was their land. They just found it. Mahko shook my hand, his grip surprisingly firm for a bruised, whipped kid. "You have a friend for life, I think." Nantan smiled. "Just doin' what I'm sure he'd do for me." Nantan untied the ponies and another Apache led them away. I tipped my hat, which raised an embarrassed titter from the ladies, and set off back down the path through the hills. I turned back and Mahko still stared at me. He raised his hand in a silent greeting, and I figured Nantan was right. I'd made a friend for life. If you enjoyed that, you can buy The Guns of Retribution for the Kindle US or Kindle UK. A funny thing happened on Saturday. A lot of my Twitter followers and Facebook friends started enthusing about the Western, purely because that week's Doctor Who episode had a Western theme. It's amazing, considering how many people said they weren't interested in The Guns of Retribution because they "don't like Westerns". The Western is a genre unique to America but it's not a genre that appeals solely to Americans. I talked about this in one of my guest posts last week, but I think that the Western as a genre is not as staid or outdated as some people seem to think. The True Grit remake is more recent than the John Wayne films people seem to have in mind when they think of the Western, and look at the success of Deadwood or Hell on Wheels on TV. Within literature, the Western has never truly gone away, but there are definitely writers working towards making it a viable and popular genre once again. 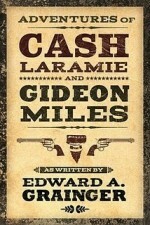 There is still a market for the more 'classic' Western tale, as the success of Edward A. Grainger's Cash Laramie story collections proves. I've reviewed volume I and volume II on my blog and I absolutely love his US marshal, Laramie. Raised by Native Americans, and partnered by the black (and totally fantasic) Gideon Miles, the stories look at issues around race, while continuing to deliver adventure and action. Grainger has also taken the unusual step of allowing other writers to tell stories using his creations - Heath Lowrance wrote the fantastic Miles to Little Ridge, while Wayne D. Dundee wrote Manhunter's Mountain. I think it's this almost collaborative approach that stands testament to how supportive the Western community is. Short stories certainly seem to be the way to go, and Matt Pizzolato's collection, The Wanted Man, offers eight stories for just 99c. It's available both for the Kindle and the Nook, as well as in paperback for $5.99. Four of the stories feature his antihero, Wesley Quaid, who now stars in his own forthcoming novella, Outlaw. But Pizzolato doesn't just write fiction - he also edits The Western Online, dedicated to all things Western. Thing is, I'm a firm believer than the Western is a genre that plays very well with other genres. If you like your historical romances, then Beth Trissel should be your go-to gal. Cowboys & Aliens proved that sci-fi works with the Western, and Back to the Future III did much the same. There's even a sub genre, named the 'weird Western', and Heath Lowrance has two stories available that mix horror with the Western. Starring his hero, Hawthorne, they're a good blend of generic elements and should appeal to fans of either genre. That Damned Coyote Hill was a spooky read, and The Long Black Train is the other Hawthorne title. 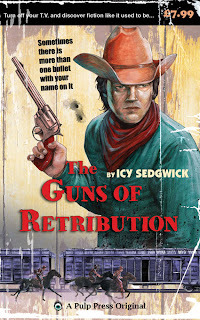 Hopefully fans of the weird Western will appreciate my sequel to The Guns of Retribution, in which Grey O'Donnell fights a foe far stranger than a crooked sheriff. To Kill A Dead Man is on my 'to finish writing' list. 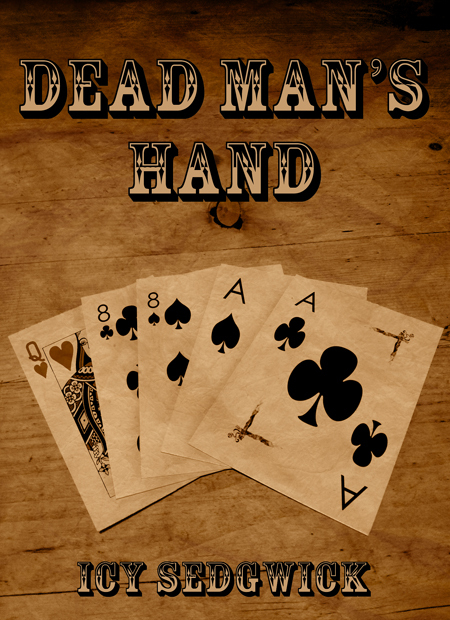 In the meantime, you can always read my three-part Dead Man's Hand, which is available for the Kindle. I just hope that people will give the Western a chance - it's a strong, vital and enjoyable genre, a heady mix of historical fiction and the action/adventure stories we enjoyed as kids. I'm not even saying that just to get you to read my book - I'm saying it on behalf of all of us.